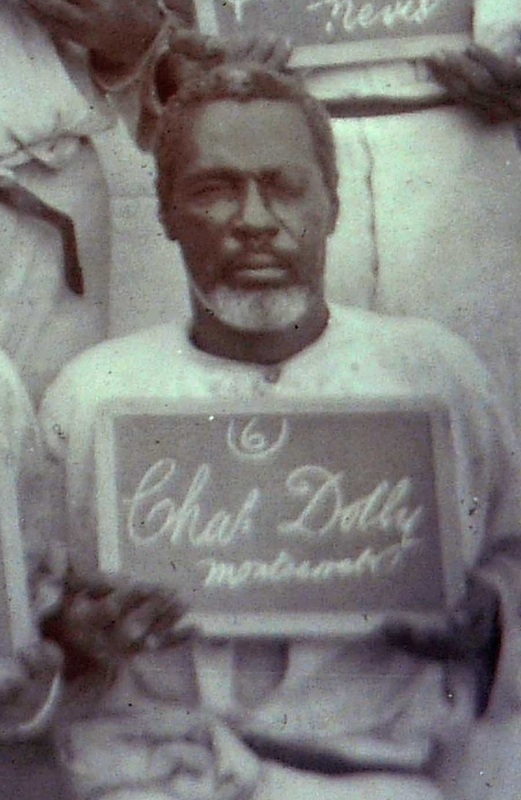 Charles Dolly was convicted on at least five occasions for practising obeah between 1898 and 1908. Known as ‘Dr Tishum’ or ‘Tickem’, he was probably born in Grenada, but spent the later part of his life in Montserrat, where all his convictions took place. By 1908 he was described as being ‘over seventy’, suggesting that he was born during the last years of slavery or apprenticeship. Photographed in 1904 in the Antigua gaol he appears strong and healthy, although with damage to his left eye which had left him partially blind. Image of Charles Dolly. 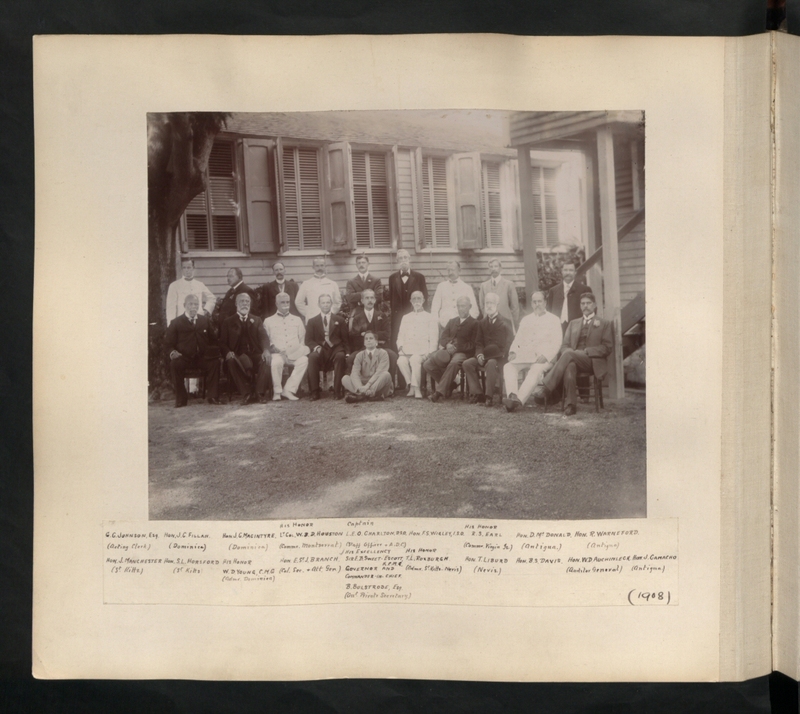 Part of a larger photograph of people serving prison sentences for obeah in the Antigua prison, 1905. TNA CO 152/287. Courtesy of The National Archives, UK. Dolly achieved a considerable reputation. He was known as ‘professor’, and when he was transferred from prison in Montserrat to the Antigua gaol in 1904, the local newspaper reported that a ‘crowd of spectators … witnessed his landing’, while another crowd assembled in the Montserrat magistrate’s court to hear his 1908 trial. In 1908 he had more than £168 in cash on his premises, a very large amount of money considering for the time. Dolly was aware of and made use of his own reputation. He gave a ‘broad smile’ to those gathered when he landed in Antigua, and at his 1908 trial managed to transform the dynamics of the courtroom by offering ‘to give a demonstration of his skill’ in divination in the Courtroom. He also on at least one occasion testified in court against another man accused of obeah, leading to that man’s conviction. Charles Dolly received sentences of hard labour for six months for obeah in 1898, 1902 and again in 1903, although he successfully appealed against the latter sentence. He was again convicted in 1904 and 1908, receiving two separate sentences of 12 months imprisonment with hard labour and 24 strokes of the cat, while in 1908 he was also subjected to two years police supervision. The court decisions and the evidence presented in court allow us to piece together a pattern revealing something of Dolly’s life experiences and spiritual practice, as well as the changing way in which the crime of obeah was dealt with in court in a period when the law relating to obeah was undergoing change. In 1903 Charles Dolly was convicted alongside two men, William Scott and Christopher (Kith) Williams, and Kith’s son James Williams, described as a boy. The four seem to have been arrested on the basis of a tip-off to the police; Christopher Williams described having been warned by two separate individuals not to go to Dolly’s house on the night of the arrest, suggesting that local people knew that the police intended to raid his house. The evidence against the defendants was the product of this raid, during which police confiscated a great deal of material, much of which was later presented in court. This material included human and animal bones including ‘two upper halves of a human skull’, a jaw bone, and a human arm bone. There were also two small calabashes, a small looking glass, part of a rosary, and two pint bottles containing a ‘nauseous liquid’. The conviction was eventually quashed on a technicality, but possession of this set of material was considered sufficient to prove obeah activity. The police presented no evidence of any activity undertaken by the defendants. several human skulls, bones, teeth, and quite a large collection of other gruesome paraphernalia of the dark practitioner. On some of these bones were written the names of several persons, more or less illegibly in pencil, while on bits of board and in an earthen jar, containing the bone, were written the names of others in chalk, a piece of cedar 15 x 11.5 ins, with a piece of looking glass inlaid in the centre, and the cardinal points written at the corners. It is easy to speculate on the meaning of the objects found in Dolly’s house, but difficult to know anything about them for certain. At a miminum, the use of human bones implies that Dolly’s ritual practice involved work with ancestral spirits. The names chalked on bits of board may represent people he worked for, or those he aimed to influence. What does seem clear is that his work drew on a range of traditions, including Catholicism in the form of the rosary, as well as African practices. Dolly’s career as a spiritual worker almost certainly began long before he was first convicted in 1898, and may well have continued for some time after 1908. It spanned a significant change in the law dealing with obeah in the Leeward Islands. 1904 saw the passage of a new Obeah Act, which authorized flogging as punishment for men convicted of obeah. Flogging was supposed to be a tool to break the authority and perceived power and status of obeahmen. Dolly was sufficiently well-known that his work was invoked in discussions of this new law. The Attorney General for the Leeward Islands, praising the 1904 Act, referred to ‘the well-known Obeahman Dolly of Montserrat’, claiming that the floggings he had received led to ‘ridicule of his practices tak[ing] the place of the dread which they formerly inspired.’ Given the continued significance of spiritual work in Montserrat today, this seems to have been, at the very least, wishful thinking on the part of the Attorney General. More likely, Charles Dolly continued to be viewed with respect and at least some awe by his fellow Montserratians. ‘Obeah’, Antigua Standard, 17 September 1904, in Sir Henry Hesketh Bell Collection, Notebook C, Royal Commonwealth Society Library, Cambridge University Library, GBR/0115/Y3011C-N.
Letter to the editor from Albert Wykham, MD, Antigua Standard, 24 September 1904. ‘Obeah in the Island of Montserrat .Twelve months and 24 strokes’, Port of Spain Gazette,19 December 1908 (Article reprinted from the Montserrat Herald, 5 December 1908). Despatch from Frederick Henry Watkins, Commissioner of Montserrat, 7 April 1903, forwarded by Governor Strickland, Leeward Islands No. 357, CO 152/280, The National Archives, UK. Reports of the working of the 1904 Obeah Act, forwarded by Governor Knollys, Leeward Islands No. 208, CO 152/287, The National Archives, UK. Report on Montserrat by W. B. Davidson-Houston, Commissioner of Montserrat, 31 August 1906, forwarded by Governor Sweet-Escott, Leeward Islands No. 378, CO 152/291, The National Archives, UK. Udal, J. S. (1915). ‘Obeah in the West Indies.’ Folk-Lore: A Quarterly Review of Myth, Tradition, Institution, & Custom 26: 255-295.